In this, I don't blame TEPCO for not having posted a video of the entire work (9 to 10 hours) on November 18, 2013. The preparation for submerging the cask started in the morning, with the cask submerged completely at 12:30PM. The removal of unused (new) fuel assemblies into the cask started at 3:18PM, and by 6:45PM 4 unused fuel assemblies were transferred into the cask. The names of the companies and the names of the workers are blurred in the video. They could be TEPCO workers, but most likely from one of the primary contractors. Compared to the still photos (see below), the water in the pool looks slightly murky. After the day's work ended at 7PM on November 18, another set of workers were scheduled to be there all night, clearing small debris and particles using a vacuum cleaner in the water. 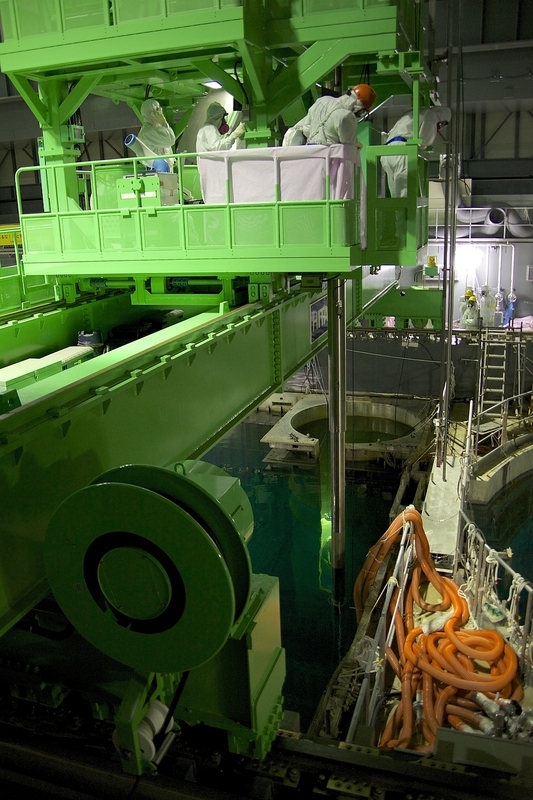 Today (November 19, 2013), the workers have removed 8 unused fuel assemblies into the cask as of 1:30PM, according to Nuclear Regulation Agency (secretariat of Nuclear Regulation Authority). The Agency thinks the workers will be able to remove additional 10 fuel assemblies to fill the cask. There are six group of workers who take turns in removing the fuel assemblies so that each group of workers spends less than 2 hours on the operating floor. Thanks for posting. Most helpful and informative. Per other media releases, TEPCO has 36 persons to do the work of removal. Even with two hours on the floor, how in the world do they insure the safety? And its safety of the individual and safety of the task they perform. Radiation causes many effects such as fatique/tiredness, nausea and more. They have to be rotated, if 6 is the working numbers. So 6 teams to remove thousands of fuel cells, and NOT become ill from radiation. Guess they are the Fukushima 36, like the Fukushima 50 we dont hear about now.....wonder where they are?? 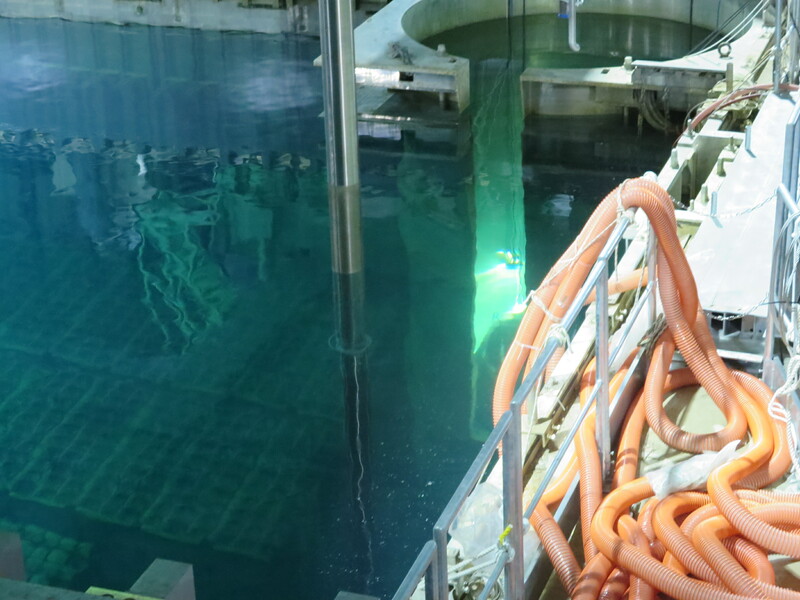 @ Anonymous : November 19, 2013 at 4:34 AM : The only radiation source in reactor 4 is the spent fuel inside the pool, which is protected by the water. There's no reason why it'd be highly radioactive, and they have had time to clean it as much as possible. The video and pictures shown don't look like the damaged SFP4. They look like PR film of some other site. Does anyone else see this as just too tidy to the real conditions they are working under? At 2:09 in the video is something quite problematic. Try looking through a pair of binoculars while wearing eyeglasses. Now try holding them even further away from your eyes -- further than the tip of your nose -- and through another surface as well (a curved piece of plastic). The optical problem is called Eye Relief (http://en.wikipedia.org/wiki/Eye_relief) and it dramatically reduces the observer's field of view and requires a very steady hand and precise focus. This clip was chosen for its PR value and it is easy to see the projection of a precision operation underway by people we can trust. But anyone who understands geometrical optics will see just the opposite in this clip, knowing that the person shown can't really see much of anything with the setup he is using. It's really bad. I sure hope somebody who can design an effective viewing system for this application (unfortunately that's not me) will see this clip and get to work on it right away. Have you seen the video of the pool taken by an underwater camera? Don't you think that there would be a camera attached to the business end of the crane? Of course, a no brainer. As to why anyone would look through binoculars, that makes no sense and it certainly is not how the crane is being guided. One may have to remember that this is a video summary, i.e., cut-out videos of an operation lasting hours. Most of the operation is not shown, hoses and other equipment pieces may get moved in the process, and lighting as well as slight camera angle changes also change color appearances of objects, i.e., saturation and depth. To conclude from this that the locations where video is taken are different ones is, imho, extremely farfetched. I concur, nothing proves this is happening in SFP4. Maybe what we are seeing is the test they had to pass in SFP5 before being authorized to proceed. 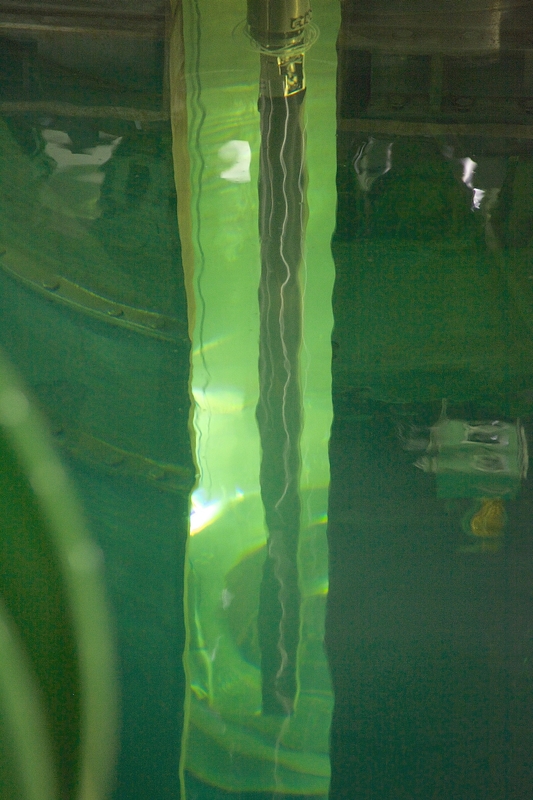 The murky water could be from the addition of boron to absorb neutrons. This, as it is believed the boron-laden panels inside the spent fuel racks have deteriorated.